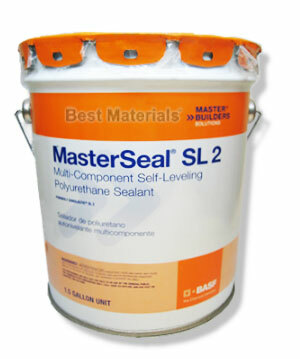 PRODUCT: MasterSeal SL2 (formerly Sonolastic SL2) Self-Leveling Wide Expansion Joint Sealant, Pre-Tinted LIMESTONE COLOR, Handles joints up to 3 inches wide. Ships as a 4.5 Gallon kit in a 5 Gallon pail. Price/Kit. Ordering Notes: Special order, shipping lead time is 1-3 weeks for small orders. For 5 or more it can be drop shipped from factory. DESCRIPTION: SL-2 joint sealant is a two-component, self-leveling, UV resistant, exterior grade, non-priming polyurethane sealant designed for sealing and waterproofing all type of WIDE expansion joints. SL2 bonds to many materials without a primer, including concrete, masonry, metals, fiberglass, etc. COVERAGE: 4.5 gallons yields about 693 lineal ft. of 1/2" x 1/4" joint. Coverage and Yield Chart for other size yields.